This is a new year, with new adventures just around the corner, but I would be selling the team short if I did not finish some well-deserved business. So without further ado, I must present our final 2 RCR Riders of the Month! 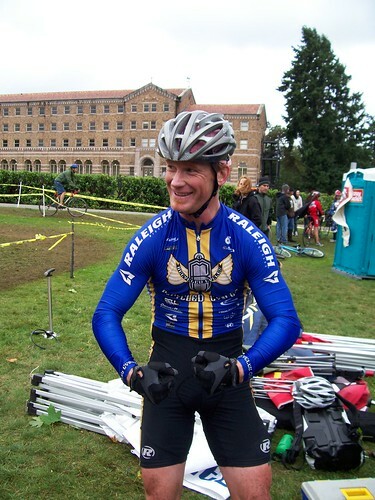 He’s Fit, he’s Fast, and he’s “Angry”… Here he is, our Master of the Mud, TIM ELLIS!!!! 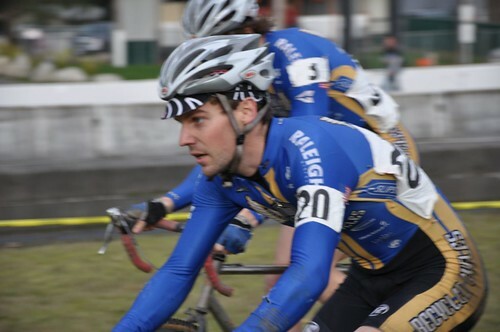 Tim made a commitment in 2008 to be a fit and fast as possible. 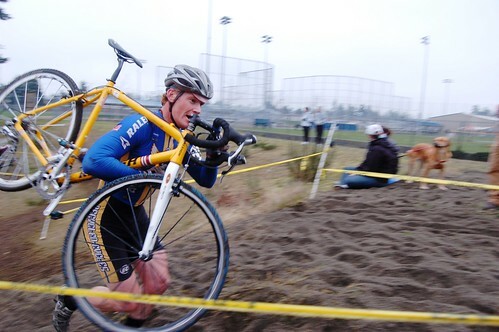 He wanted to really fight for solid placings in the Catagory 1/2 field in Cross. 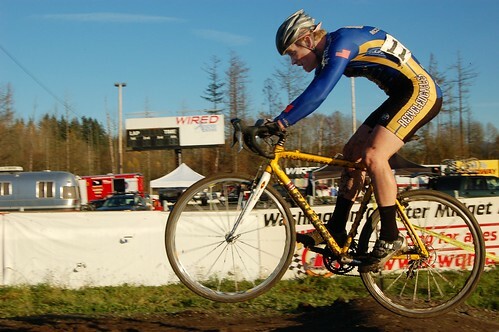 Well, he did that, coming in with consistent Top Ten finishes, and netting him a 6th Place finish in the Seattle Cyclocross Series!!! His commitment to racing has been fantastic to watch! Great Job Tim!!! The final RCR Rider of the Month has been a fixture at races, and his attitude is second to none. 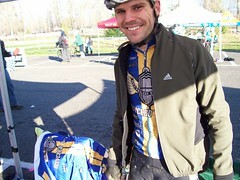 December’s Rider of the Month is one of our Fly-weight mud warriors, DAVID BURKE!!!! 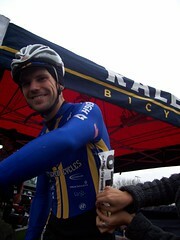 His quiet demeanor and easy smile masks the true grit it takes to race cross at that level. Seriously David, we’re proud of you! Well, those are the last 2 ROTM fo 2008. I know it was a long time coming, but good things come to those who wait! 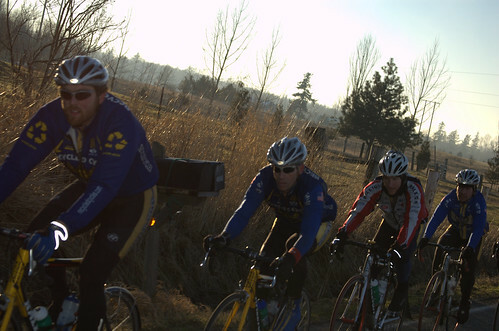 In the coming weeks we will announce not only the first Rider of the Month for 2009, but also our pick as the 2008 RCR Rider of the YEAR!!! As the evening wound down on our first night in Bellingham, a knock was heard at the door. Who could it be? I’ll tell you who: This Guy. Yep, our very own Raleigh Marketing Guru, Brian “Sally” Fornes decided to grace our humble team with his presence. We welcomed him in with open arms and “relieved” him of his Frosty Burden. When we awoke the next day, the routine was the same: Get up, Chow down, Suit up. Today was to be an even longer outing, reaching off into the eastern hills by the Nooksack Racecourse. Alas, not 10 miles into the ride, the freezing fog and slick roads conspired to put a couple fellas on the deck. 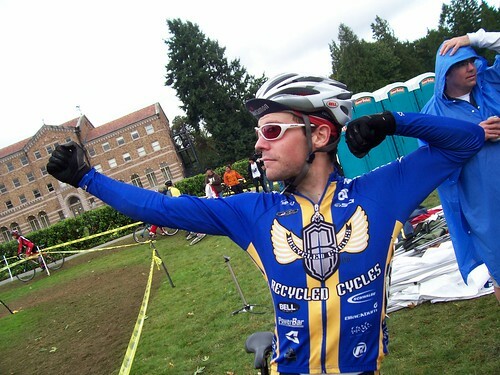 When the bikes were cleared away, Our very own Adam “Turtle” Jablonski was nursing what turned out to be a separated shoulder. The rest of the ride was documented by Brian over on the Raleigh Blog as I was charged with keeping AJ company in the ER (Big fun, let me tell ya). 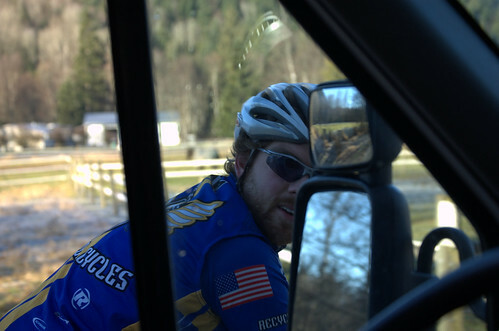 Fortunately, Adam is healing, the rest of the ride went great, and Blake made another GREAT meal to fill all the hungry bellies. All in all the camp was great for the team’s morale as well as our fitness. 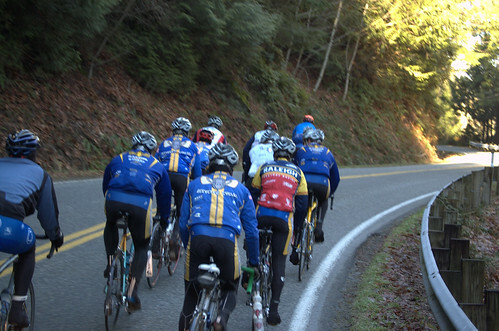 Bellingham always seems to be where the season starts, and it’s shaping up to be a great year! 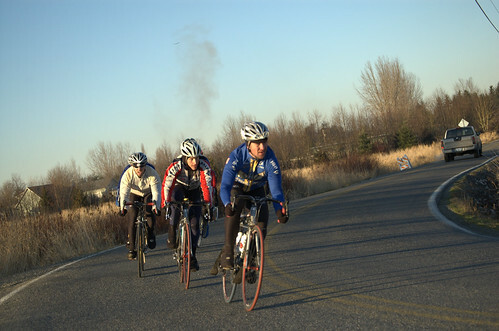 Last weekend the intrepid Racers of Recycled made the trek North to brave the cold and get some killer miles in God’s own Country. Well THIS year wasn’t going to be like that (so we hoped). We rolled out of bed, had a delicious group meal, and got ready to rock. 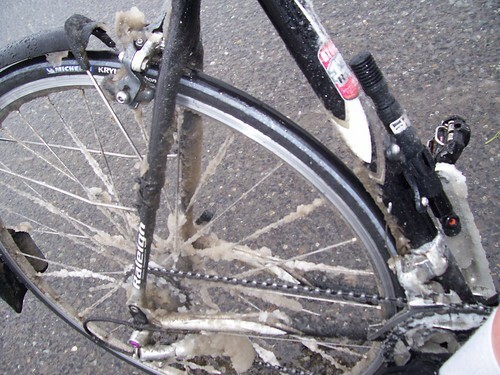 After the first 70 or so miles, the ride finally flattened out a bit and the pace picked up. The boys were pinning it for the last 25 miles! It was a great ride, with almost 100 miles covered. The best part being that a few guys turned off at the 70 mile mark and went back to the house to make sure that a GREAT meal was waiting for the team (after some showers, of course!). A huge thanks go out to these 3 guys: Carl, TBD and Steve. 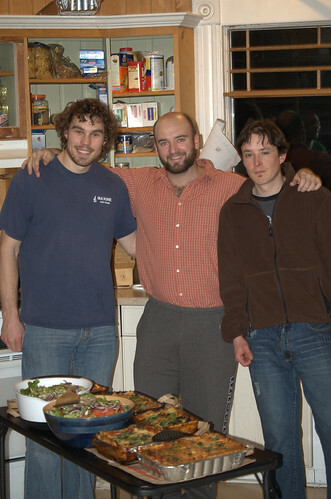 (and a special thanks to Tyler Blake Davis –center– for making the meals all weekend!). The rest of the day passed with stretching, food, Bicycle-related movies, MORE food, and that evening, a visit by the Raleigh Fairy!! !